Apple iPhone offers a complete another level smartphone experience for its users. Not just for the design or the specs, the ease of tasks which the device performs is something which users fall in love. It’s quite wondering to see how the new age iPhones have evolved to record a 4K video as well. The intensity which an iPhone carry to shoot and edit videos is pretty much impressive. On the other hand, the smartphone provides gestures to edit video on the devices itself with some best video editing apps for iPhone. Perhaps, video editing apps have added in the must to have list of apps in a smartphone. Be it a small Instagram story or a clip you wish to share with your friend, editing comes in the way. 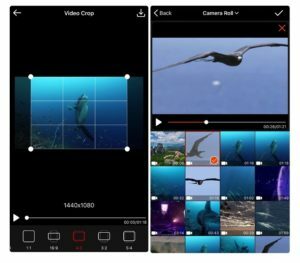 Cutting down all the hassle of editing a video, these video editor apps for iPhone makes it much easier. These gestures provide a quality of output with the video editing apps for iOS makes the platform a practical place to work. Here we detail you the list of best video editors for iPhone and iOS devices. If you love to make your presence regularly on social accounts, Clips is the right choice for you. The app makes your story ready at the edge of your fingertips. The structure allows you perform a quick edit with a clear view of what the final output will be. You can work on a recorded clip or you can directly record the clip within the app. All you have to do is get it into Clips square viewport, rearrange thumbnails. Now, choose the right effect of your choice and launch the final out. Also, you get live titles and animated posters to enhance your creative skill a bit ahead. Another area where this app excels is when you have an iPhone X and you make selfie scenes. Missing some android-like features for better pics and videos on your Instagram account? Quik is the really Quick solution for you mainly aimed to serve Instagrammers. Well, it can assist you with all your editing needs though. The design helps you with easy editing features and falls among the top video editing apps for iPhone. The features are so handy that you can just select the clip and pick a theme. That’s it your video is good to go for an upload on your social page. Besides that, you can squeeze the maximum out of app with the available style, pace, font, titles, filters, and trims. The only thing you have to do is, choose the pic or video and let the app do rest. Be it a pic collage or a video to share a story, Quik never disappoints you. If you are not particular, the app knocks you with a video compile of your pics every week. And the greatest is it claims to be one of the best free video editing apps for iPhone users. Video Crop is the best pick if you are looking for a tool for cropping videos. Essentially, it is a video editor app for iPhone just to crop video clips and nothing beyond that. Yet, it does its duty with ease and crops a video quickly and smoothly. However, the app is capable of cropping in free ratio or even if you select a fixed ratio. Also, you can set custom ratios and crop accordingly. Love detailing in your edits? Wish to edit each clip individually? Splice is an awesome video editing app for iPhone which you can get it for free. The set of features like filters, transitions and add text will impress you so much with ad-free experience. You can adjust the speed and choose the audio of your wish among the multiple audio tracks. Essentially, the app allows editing each clip in detail. Yet, there is a complain that the app trims and cuts within the clip edits. However, it can be sorted out with a bit of detail in the workflow. Never the less, Splice is a good video editing app for iOS platform. This app from Apple suite is an awesome place to edit video on an iPhone. The app now comes pack in the newer iPhones and other Apple devices. Essentially, this is one straight solution for all your video editing on iOS platform. iMovie is a no-nonsense video editor for iPhone users which helps users to edit videos in iPhone itself. Just import your videos, and photos into projects, and edit them with the available premium features. The apps assist you to edit videos by slicing the videos, arranging them on the timeline. Also, it allows adding transitions to the clip. Editing video in an iMovie app is a whole new level experience with many user-friendly gestures. The rage of filters, themes and other options like adding text overlays enhances the video output to next level. Undoubtedly, iMovie stands on top of the best video editing apps for iPhone and other iOS devices. Now, this is another simple video editing app for iPhone and iOS devices available. The app is popular for the themes it offers and the other options like music and video length. Discussing more, the app is quite simple and easy to use. Just set all the filters and trimming length and relax, the app makes the video and sends a notification when it’s done. The only downside of the app is you cannot expect features like tilt video and so. But, it is a great tool to get exactly what you what if you are a basic user. Videoshop is a wholesome package of all editing stuff in one app. You can look no further to choose this app for all your editing needs. You can either import the clips from your gallery or can record clips directly from the app. The options like add text to the clip, add narration, merge multiple clips helps in transforming videos. There are few more traits like adding tilt-shift to the video and transitions between multiple clips. Furthermore, you can also add filters and themes to finished video. Also, the app displays author name and allows adding a title to the video. On the other hand, it also acts as a platform to directly share the video with social accounts. Altogether, Videoshop is the best video editing app for iPhone users. From the developers of Vimeo, Cameo stands as a unique video editor for iPhone users. If you looking for a video editor for basic use, then Cameo app is the best choice for simple video editing. The simple interface performs all the basic edit for your video before you upload it to the world. Using Cameo apps is a thing just at the edge of your fingertips. Just import pics and videos, trim and add music, theme, and export it. You can also manage the intensity of the theme and can also export video with upgraded resolutions like 720p, 1080p, and 4K. To conclude, the new generation iPhone is capable of doing lot more than you are making use of it. 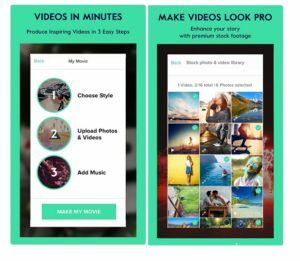 The above list of video editor apps for iPhone brief you the probable ways to get the best out of it. Yet, it all depends on which one you choose and serves you best for your movie. The above apps cover an entire range of video editing needs for your movies stored to share with the world.